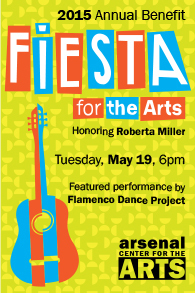 “Fiesta for the Arts” Honoring Watertown’s own Roberta Miller To Benefit the Arsenal Center For The Arts! The Arsenal Center For The Arts will host its annual spring benefit on May 19, 2015honoring Watertown arts activist and Arsenal Center founding member Roberta Miller with this year’s Charles Mosesian award for Support of the Arts. Fiesta for the Arts begins at 6:00PM on Tuesday, May 19th and features Flamenco Dance Project with dancers Sabrina Aviles, Yosi Karahashi, and Ian Hoover, with Juanito Pascual on guitar and Tania Mesa on violin. An open-air reception begins the festivities with Spanish tapas. After the award ceremony and dance performance in the Mosesian Theater, scrumptious desserts donated by local bakeries will be served. Each year, the Arsenal Center honors an individual or organization that shares the late Charles Mosesian’s commitment to his community. The late Charles Mosesian’s remarkable one million dollar gift played a pivotal role in launching the Arsenal Center’s building campaign, and his leadership inspired others to lend their support to create what is now a flourishing arts center. The 380-seat theatre, named in his honor, offers nearly two hundred performances annually in a variety of genres. Roberta Miller will be honored for her longstanding commitment to Watertown and the Arsenal Center for the Arts. As a former elected Town Councilor, her expertise in organizational development led to her public appointment to the redevelopment authority, which transformed the former U.S. Army superfund site to a commercial and public resource for Watertown and Greater Boston. Miller served as a founding board member and co-chair of the six million dollar capital campaign that established the Arsenal Center for the Arts, and as former board President of the Watertown Community Foundation. Miller is currently supporting early stage start up companies, fostering local initiatives and innovation strategies in her work at The Arsenal Project. Proceeds from the evening directly support the Arsenal Center For The Arts and its programs. Tickets are $75 and may be purchased at www.arsenalarts.org or by calling the box office at 617-923-8487.